The Hydro Sheen Filter is the ideal filtration device for polishing sheen from indoor or outdoor water discharge operations of portable secondary containment, spill berms, spill pallets and more. 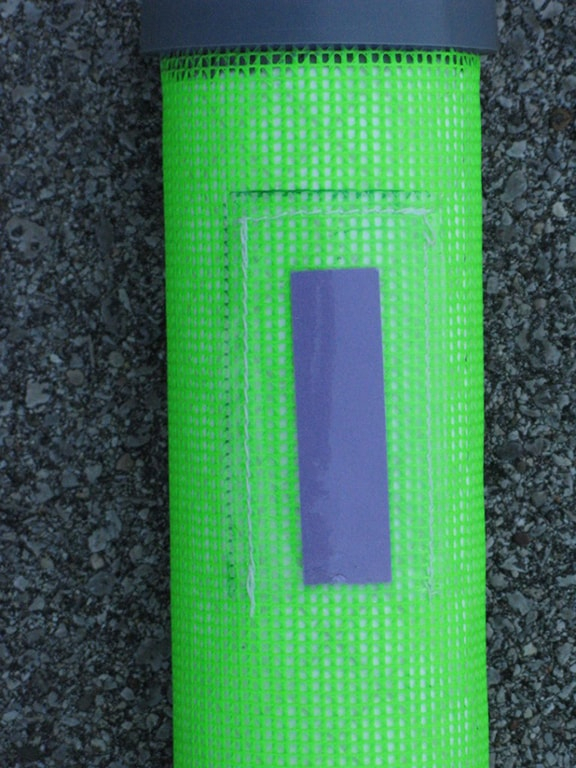 The state-of-the-art Hydro Sheen Filter is a portable secondary containment solution that utilizes the technology of patented Agent-Q (owned by The Justrite Safety Group: US Patent 8,986,822), a high-strength, lightweight hydrophilic spunbond, non-woven fabric with Justrite oil solidifying polymers embedded between quilted layers. Waste water flows freely through the filter while capturing light to heavy sheen. During the filtration process, a Hydrocarbon Detection Strip is placed against the skin of the outer skin of the filter. The strip turns a darker color to indicate when the filter is spent and needs changed. 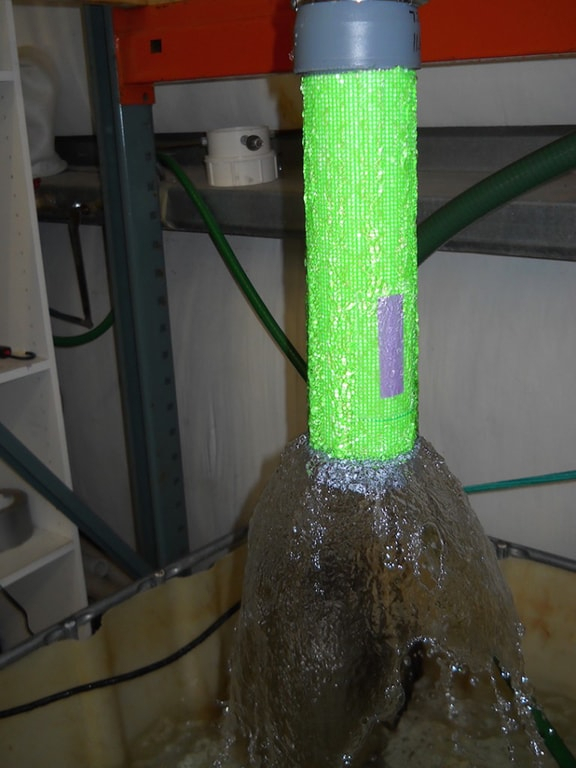 A zinc strip is placed on the filter to prevent growth of algae and mold. 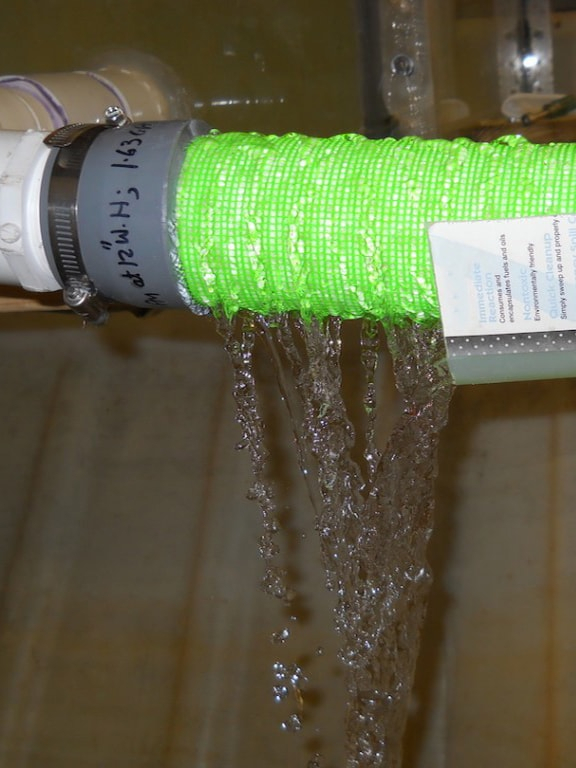 The Hydro Sheen Filter can be installed easily over threaded or non-threaded outlet pipe. The accompanying pre-filter fits nicely onto the inside discharge drain. The flow rate for a 2 inch x 12 inch filter with 12-inch water head in vertical position is 11.29 GPM (677.4 GPH). The flow rate for a 2 inch x 12 inch filter with 12-inch water head in horizontal position is 7.91 GPM (474.6 GPH). Heavy-duty, flexible, chemical resistant urethane collars for quick and easy installation. Exterior of filter is highly visible UV resistant coated mesh that is abrasion resistant, anti-fungal and mildew, flame retardant, Phthalate-free, antimicrobial and has a high tensile strength. Filter medium is Agent-Q (US Patent 8,986,822). Filter contains about 120 grams of Justrite oil solidifying polymers. Agent-Q will solidify hydrocarbons in temperatures ranging from -30 to 130 F.